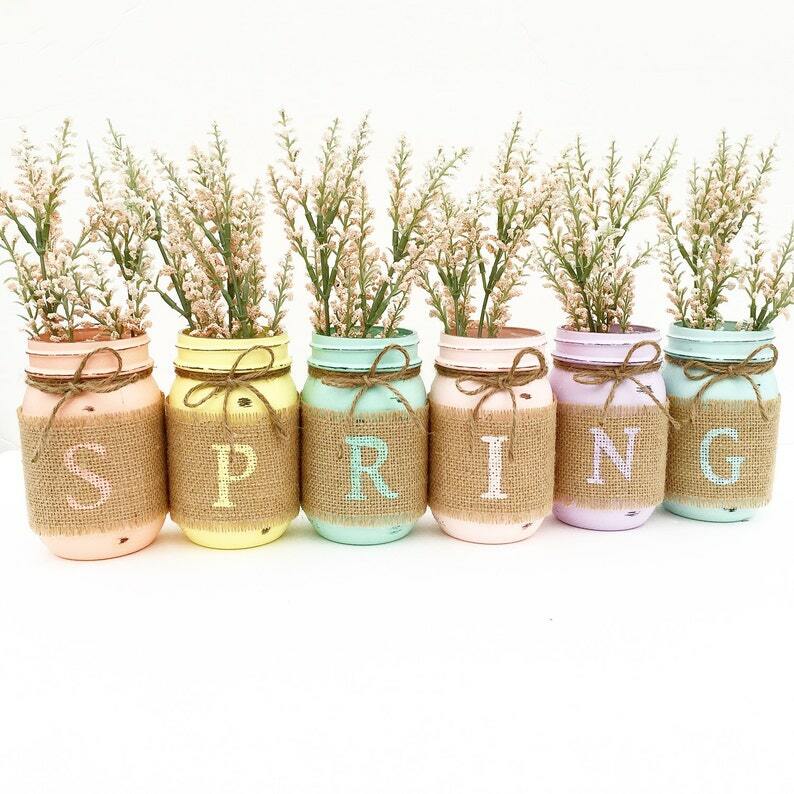 This is a beautiful, hand-painted set of 6 pint size Ball Mason Jars wrapped in burlap to spell out the word "Spring" ! Perfect for matching any Spring or Easter decor! Decorate your mantle, place on an accent table or use as your Easter table centerpiece filled with your favorite fresh or faux flowers - the possibilities are endless for this gorgeous set! The set includes 6 pint sized Ball mason jars. Each one is hand painted in one coat of pastel coral, yellow, mint, pink, purple and aqua then perfectly distressed and sealed. The colors will be light to keep their rustic appearance! The jars are sealed with a matte sealant for the occasional water splatter, however, they may not be submerged in water! Please use a damp cloth and pat dry for cleaning. Since they are sealed, fresh flowers make a perfect match for this set! Have a different color request to match your decor? Would you like a different word added to the jars? Different size jars?! We welcome custom requests everyday, just convo me and I'll be happy to help and make it for you!! Thank you for checking us out at Midnight Owl Candle Co. !! After selling thousands of these jars, you can be fully assured that you only receive a beautifully handcrafted, one of a kind quality set that will bring you years of happiness! Read over a thousand customer reviews and see for yourself that you are in good hands with Midnight Owl! Payment is always expected at time of purchase. Please private message us for any check/money order purchases. Anytime a check or money order is used for purchasing products, the payment method must be recieved before order will be shipped. If you would like to add shipping insurance on your order, please contact us directly and we can add insurance for you at an additional cost. Due to the nature of the product, we handle returns on a case by case basis. If an item is damaged or of defect, we will immediately do what we can, to resolve the situation. Customers may request to cancel an order within 24 hours of their purchase. If the item has not been made, we will gladly issue a full refund. We do not offer any type of refund on custom listings or sale items. If you ever have a question or concern regarding your order, or feel you are unable to give us a 5 STAR rating, please contact us immediately. ** please read current shipping time frames before placing an order* Once an order is placed and your item is made, we are unable to issue a refund. * During the fall and winter months - it is possible for some candles to develop a light flakey appearance. This is called "frosting" and is very common with candles made from soy wax. Some candles may also develope clear "wet spots" due to the colder temperatures during shipping, frosting may occur. This will not effect the candle burn or scent throw of your candle. We do not issue refunds for this as this is a normal trait of soy candles. We must be notified within 7 days of your order delivery date with any issues regarding your order. This includes missing/damaged items, items not received, missing packages etc. After the 7 day mark we are not responsible or liable for any type of refund. We do not issue refunds due to shipping overages since this cost includes packaging/shipping material and handling, to ensure If your item is not damaged during shipping. In the event your item is damaged during shopping (ex: cracks, broken glass etc.) you must file a damage claim on the usps.com website before an order is replaced. Please send a note with your order or private message us if you would like an in person or must sign for delivery. At times the shipping carrier may leave packages at your door. We are not responsible for lost/missing/late mail or packages. You must contact the shipping carrier to locate your package or file a claim with the carrier for a refund. Once an order is placed and the item is already made, we will be unable to offer a refund for that product. All of our items are handmade and once an order is placed we are unable to re-package items for another customer. We do not refund due to the arrival of late packages. We always ship our packages (U.S. Orders only) via 2-3 day priority mail. We attempt to send packages the quickest and most affordable way possible. If a package is lost/late or missing, we cannot issue refunds. A claim must be filed with the us postal service. We also do not refund costs due to expedited requests sent with your order. Please contact us directly if you have an expediited order request. If we can accomidate your order, we certainly will! We do not issue refunds for scents or items that are not to your liking. We truly take our time to pick and choose scents/colors/designs carefully. We apologize in advance if the item you have chosen does not completely satisfy your taste. We attempt to please and accommodate every customer. Customer satisfaction is always our biggest priority. Please contact us directly if you have ever have any questions or concerns regarding our policies. Purchasing from Midnight Owl Candle Co. insures that you have read and agree to all of our shop policies. ALL of our shipping turnaround times are listed in each individual listing. We ask for any expedited orders, special requests, etc.. that you contact us directly, BEFORE placing your order. Once your order is shipped, you will receive a shipping notification along with a tracking number. Most of our packages are shipped via usps priority mail which include $50 of insurance in the event of damage. We do NOT refund for shipping overages since our shipping prices include the cost of packaging and shipping materials. If you would like place extra insurance on your packages, please contact us prior to ordering and we can create a custom listing for you. Please make sure your shipping information and address are correct before placing your order. When placing your order you agree that we are not responsible for ANY shipping issues or errors. Midnight Owl Candle Company is not responsible for lost, damaged or late packages. We will make every attempt to help fix this issue, however cannot be responsible for another businesses' errors. If an order is returned to us for any reason it is the buyers responsibility to re-pay the shipping costs. Our shipping labels are printed with the information you input into the address field at checkout. In rare instances, due to weight, shape or size - we reserve the right to ship your order via a different delivery method. This can and may include first class (regular) mail. In the unlikely event your item arrives to you damaged, we will make every attempt to correct and fix this issue for you. Upon receiving your item, within 48 hours as must receive proof of damage from the buyer (or within 14 days of your purchase date for items not received) To file a claim with the USPS - we are required to submit photo documentation of the item to prove it was damaged. Within 48 hours of receiving the item, please send us a picture of the broken item (several, if possible), a picture of the box/package that your item was delivered in, as well as a picture of the shipping label that is on the shipping box. Please send this information as soon as possible. We will then submit the claim to the USPS. It can take 1-2 weeks for the USPS to approve or decline the claim. Once we receive a determination: If the claim is approved, we will immediately re-ship the item to you, If the claim is denied. we will contact you and advise it would be the buyers responsibility to purchase a new listing or attempt to re-file the claim with the usps. Our ultimate goal is to ensure every customer is happy with their products. We will try anything we can to help you in these rare instances. We must be notified within 7 days of your order delivery date with any issues regarding your order. This includes missing/damaged items, items not received, missing packages etc. After the 7 day mark we are not responsible or liable for any type of refund. After 7 days of the delivery please refer to usps.com and go through the claims process. We gladly accept wholesale orders! We can customize any shape, size, scent and even create custom labels! Let your imagination run wild! Our wholesale pricing starts at 50 candles. For events, weddings, baby showers and custom favors, please message us directly for custom pricing! We look forward to working with you and helping with your special occasion! We always recommend burning your candle in a safe, draft free place, away from any fire hazards. Always keep your candle wick trimmed to 1/4" at all times. We recommend burning your candle in 3-4 hour increments to reach maximum burn times. Midnight Owl Candles are made from soy wax. Our candles are cleaner burning, longer lasting and made with cotton wicks. Every candle is unique and hand poured, so every batch may be slightly different. A characteristic of soy wax is a white like substance called "frosting" along the top or sides of the candle. This does not affect the candle burn time or scent throw. We try to minimize the effects of frosting, however it is impossible to eliminate this natural characteristic completely. Our candles may be sent in a kraft gift box at no additional charge! Please add a message in the "notes section" at checkout, requesting your order be sent in a gift box.